The waters off Australian beaches are suffering under a plague of plastic, as urban life strangles nearby fish and birds. Researchers have produced updated figures for the impact on coastal wildlife, as it struggles under the weight of modern man’s refuse. The new study shows three-quarters of the rubbish found off Australian beaches is made of plastic, and is having a dramatic effect on wildlife. The Commonwealth Scientific and Industrial Research Organisation (CSIRO) study covered the immense Australian coastline at intervals of about 100 kilometres, to compile the world's largest collection of marine debris data. The report is part of a large marine debris research and education program covering three years of various projects. It was developed by Earthwatch Australia and CSIRO with backing from energy group Shell. Research so far has so far found the two main drivers of marine debris pollution to be littering and illegal dumping. Rubbish such as bottles, cans, bags, balloons, fishing gear and items lost or discarded at sea pose many hazards. They can interrupt ships’ navigation, smother coral reefs, transport invasive species, destroy wildlife and harm the tourism industry. Littler can kill and injure wildlife through entanglement, ingestion, an indirectly through the chemicals it introduces to marine ecosystems. 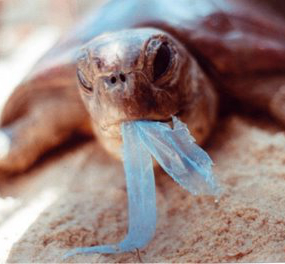 The survey found turtles eat clear strips of plastic in particular, which resemble the jellyfish they normally survive on. CSIRO estimates that between 5,000 and 15,000 turtles have been killed in the Gulf of Carpentaria after becoming ensnared by derelict fishing nets. Birds, meanwhile, were found to have eaten everything from balloons to string. The study found 43 per cent of seabirds had plastic in their gut, with the Tasman Sea standing out as the region of highest risk. Entanglement was found to kill and maim turtles, whales, dolphins, dugongs, fish, crabs and crocodiles and other species.